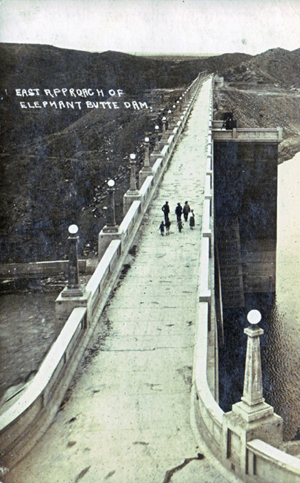 Construction of the Elephant Butte Dam, which commenced in 1911 and was completed in 1916, is the most significant event in the history of Sierra County. The dam has been closed to traffic since 9/11/01. Special arrangements will allow visitors to walk across Elephant Butte Dam on one day ONLY – January 7, 2012 – from 11am-3pm. The celebration begins at the Dam Site Recreation Area. A flag ceremony, speeches, music, food, video interviews, historic photos, brochures and books will be on display at the Dam Site. Vans will take visitors from the Dam Site to the dam overlook and will return visitors to the Dam Site restaurant for a $10 buffet lunch (optional). The event is free and there’s plenty of parking; lunch tickets will be available the day of the event. A map of Elephant Butte Lake is on the Sierra County Tourism & Recreation website. WALK ACROSS THE DAM is the first of Sierra County’s Centennial events. Traveling exhibits will be an adjunct to already planned Sierra County festivals, including the T or C Fiesta and Sierra County Fair. If you enter Engle, NM as your destination on Map Quest, you will find directions to the general vicinity of Dam site. If you are coming from Albuquerque, on I-25 exit at 79. Merge on cemetery Rd. continue down Date Street until you see a stop light at Third and Date. Turn left. You are now on Highway 51. Dam Site is approximately 3 miles. As you travel east on Third Street/Highway 51 you will cross two bridges. After crossing the first bridge stay on the main road. As you cross the second bridge you will start climbing a rather steep incline. You will see Elephant Butte Dam to your left. There will be areas marked for parking as you top out on the highway. There will also be police officers or state park personnel to guide you to parking areas.